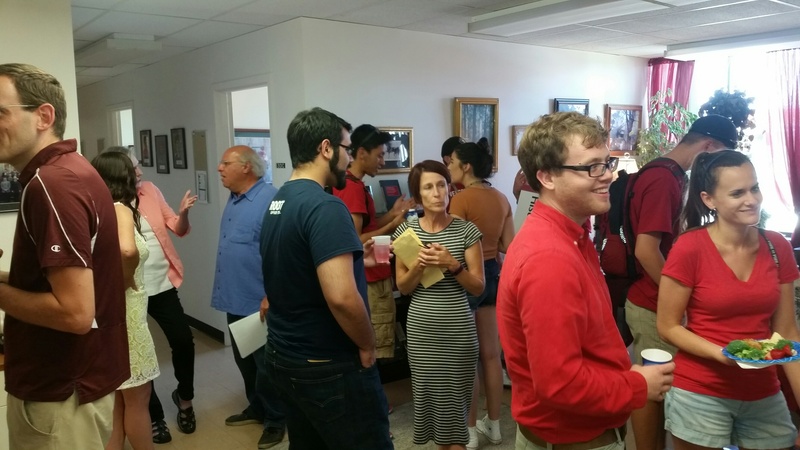 In conjunction with the College of Arts and Sciences’ Week of Welcome, the Department of History hosted an open house August 18. Several faculty and graduate students attended and discussed various programs with interested students. 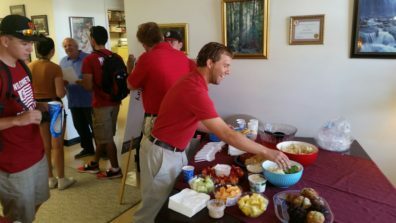 A variety of refreshments was enjoyed by all. In conjunction with the College of Arts and Sciences’ Week of Welcome, the Department of History will host an open house for incoming History students on August 18, 2016. WHEN: August 18 at 3:30 p.m. This year marks the fourth annual Daylight Creek Gathering in Virginia City, Montana. Commemorating the Treaty of September 24, 1868 with the Mixed Band of Shoshone, Bannock, and Sheepeater people and Tendoy’s Cession Document of January 3, 1870, forms the foundation of this annual event. The 2015 Gathering celebrated the dedication of Tendoy Park in Virginia City, and this year’s event will feature presentations by members of the John and Janet Creighton Public History Field School, focusing on preliminary interpretive plans for Tendoy Park. 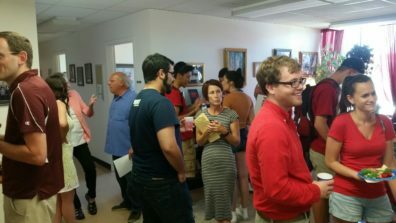 The three-week (May 23-June 11, 2016) field school (week one: Virginia City; week two: Salmon, Idaho; week three: Fort Hall Indian Reservation) put 10 WSU students into a collaborative public history setting where they conducted research, designed, and produced preliminary interpretive plans for Tendoy Park. 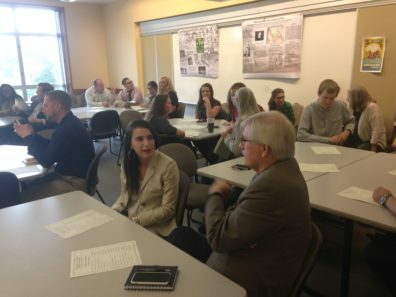 Allison Bremmeyer, Jared Chastain, and Alicia Woodard will present the field school’s student “deliverables” to tribal and municipal stakeholders at a public presentation at the Madison County Courthouse on Saturday, July 16, 2016. Their presentation represents public consultation with the affected parties. For more information, see the Year 4 Poster for this event. Contact can be made with Leo Arriwite (208) 478-4041 or Theresa Bache at (208) 236-1187. WSU – Tri-Cities (in Richland Washington), is hosting a conference March 17-19, 2017: “Legacies of the Manhattan Project at 75 Years.” A Call for Papers has been issued with the abstract deadline of September 1, 2016. 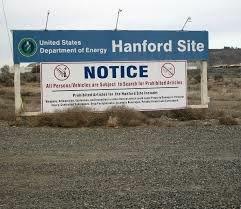 For more information, visit Hanford History Project. Abstracts are limited to 250 words. Conference papers are anticipated to be published as an edited volume in the following year. 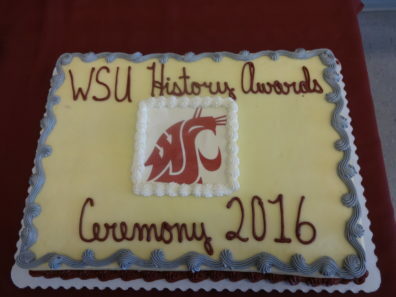 Send abstracts or questions to ourhanfordhistory@tricity.wsu.edu. Once a small farming community, the area was transformed when it became the site of the Manhattan Project’s plutonium production facility in the Second World War. 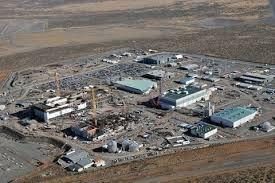 Hanford continued to produce plutonium throughout the Cold War, contributing to the nation’s national defense, even as the environmental cost built up locally. In recent years, Hanford has been the site of an extensive clean-up effort undertaken by the US Department of Energy in agreement with the US Environmental Protection Agency and the Washington State Department of Ecology. On May 7, many undergraduate History majors and three Masters Degree recipients participated in the graduation ceremony at Beasley Coliseum. 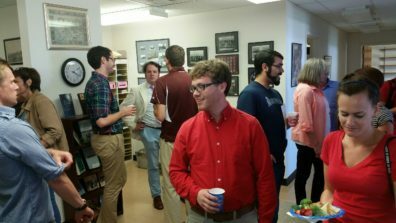 The Department of History hosts a luncheon each year on graduation day to honor History majors, double-majors and graduate students. A complete list of the class of 2016 can be found here. The photo above is of some History students ready to begin their new lives. 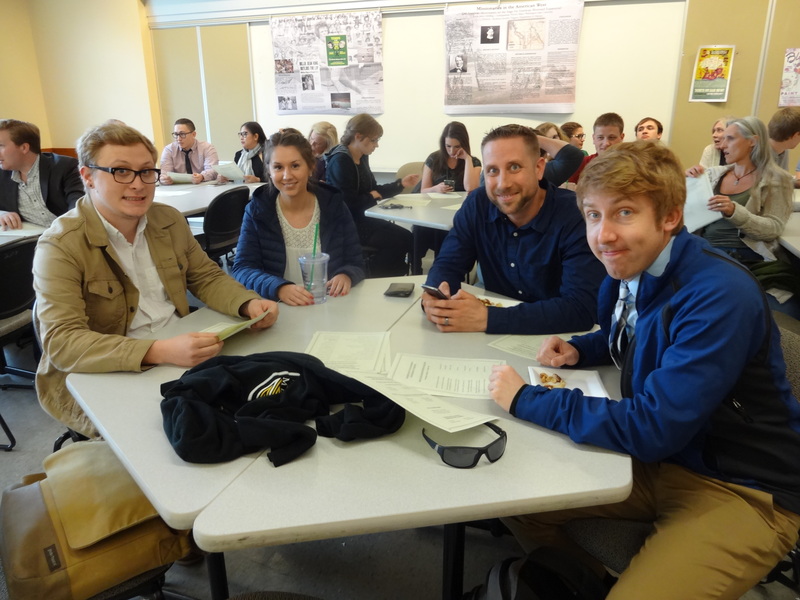 Above are Brittany Maziarz, undergraduate receiving her BA, Jason Hogstad and Calen Rau, two of the graduate students who have earned their Masters degrees and Alistair Fortson who earned his BA in History. James Anderson, also an MA recipient, could not be in attendance. 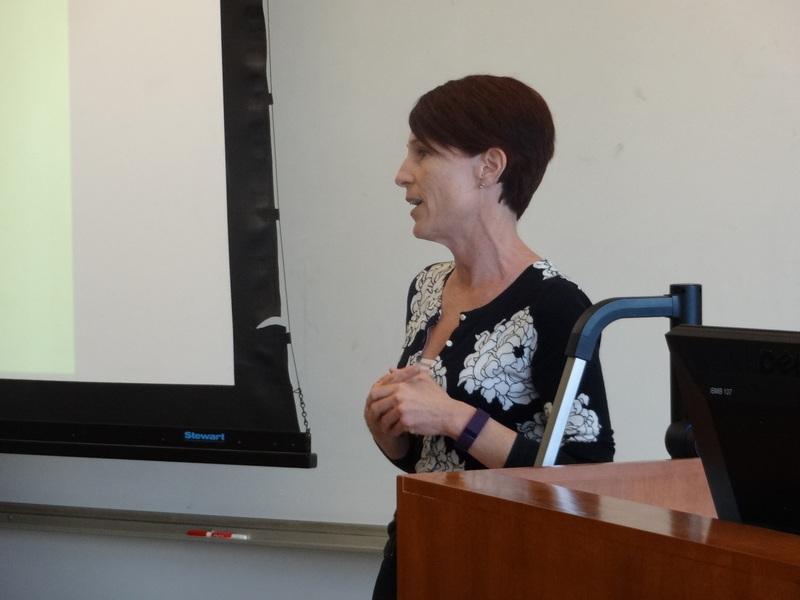 Professor Theresa Jordan, Clinical Associate Professor of History, and Olivia Murphy, who earned a BA in History with an English minor. 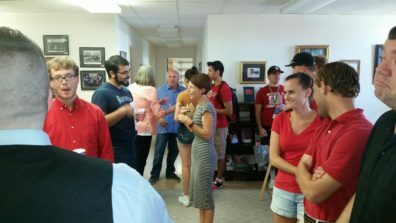 Some of the students and parents in attendance May 7. 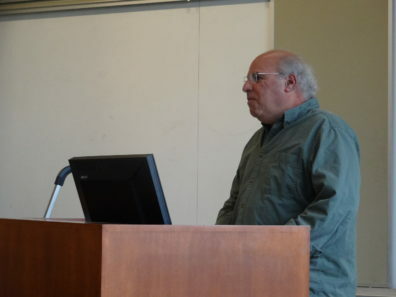 Many scholarship and fellowship recipients attended this year’s awards ceremony on April 29. Thanks to great alumni and friends, the department is blessed with numerous scholarships available to our majors. Many undergraduate and graduate students have excelled in research, writing, and academic excellence. Dr. Steven Kale, Chair of the Department of History, introduced Dr. Jennifer Thigpen and Dr. Matt Sutton who gave students certificates. 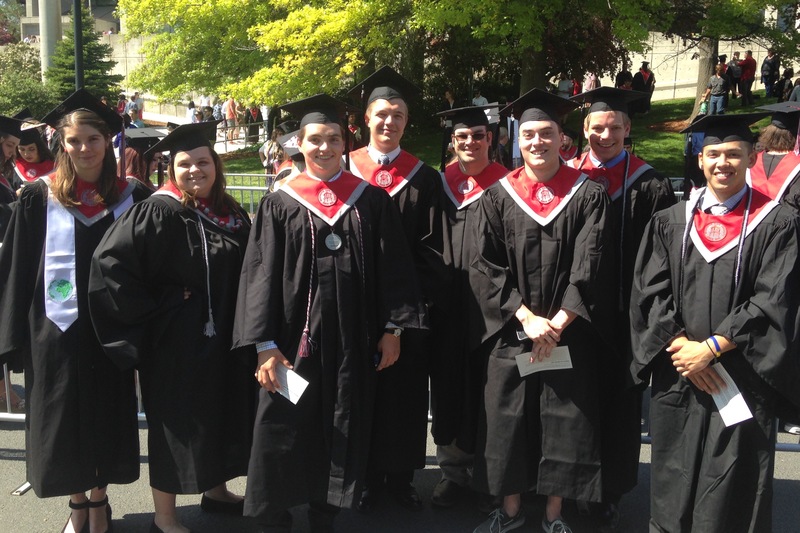 Several students earned more than one scholarship or fellowship. Dr. Jenny Thigpen presented a PowerPoint of undergraduate projects and photos. 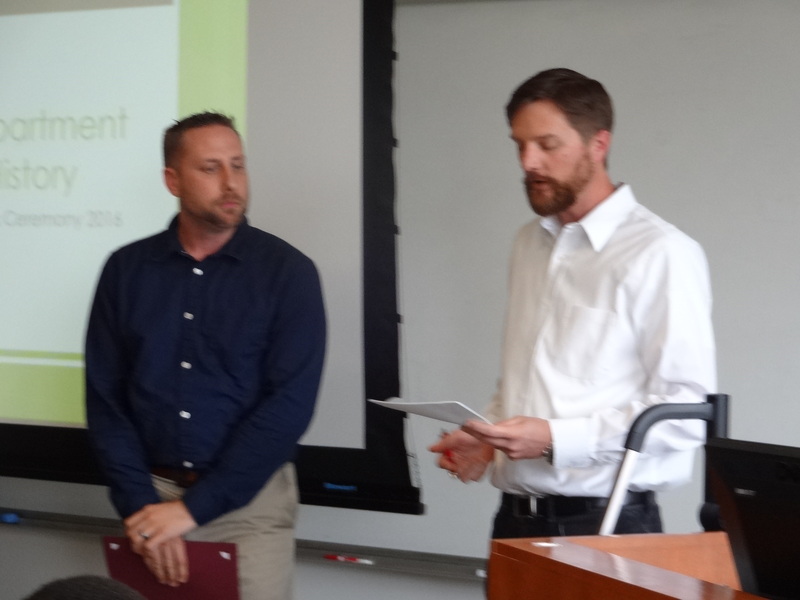 Dr. Matt Sutton and Graduate student, Greg Atkins. 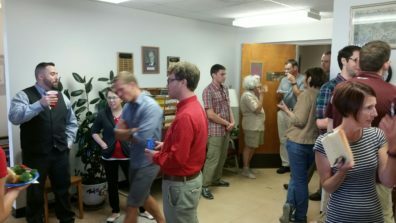 A group of graduate students awaiting their awards. The ceremony was well attended by faculty, undergraduate and graduate students. 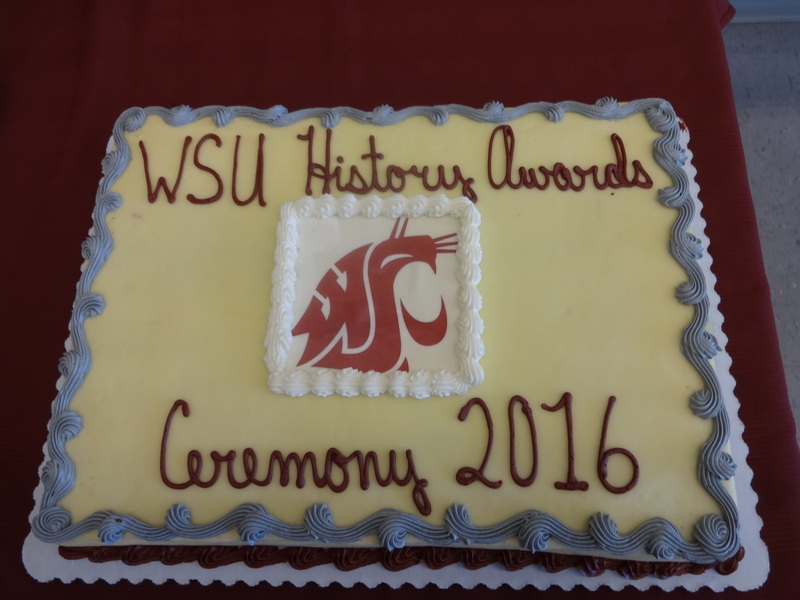 See the 2016 Awards Program.